Representative Honours: Northern Ireland: 27 Full Caps / 3 Goals (1980-1985), 1 Under-21 Cap (1978), Youth Caps, 3 School Caps (1972). Club Honours: (with Tottenham) FA Youth Cup Winner 1973/74; (with Blackburn) Football League Division Three Runner-Up 1979/80. Spotted by Tottenham playing schools football, Noel Brotherston went on to win an FA Youth Cup winner’s medal and gain Youth caps for Northern Ireland. He helped the Northern Ireland Youth team to the European Championship finals but made just one first team appearance for Spurs before being released in 1977. He was snapped up by Blackburn manager Jim Smith, and proved to be one of his most astute signings. A ‘tricky’ winger, in the old fashioned sense, Brotherston’s electrifying performances were a beacon in an otherwise troubled time at Ewood Park. 1977/78 saw Brotherston finish as Blackburn’s top scorer with 11 goals. Blackburn were relegated from Division Two at the end of the 1978/79 season, but jumped right back the following season, winning promotion as Division Three runners-up. It was Brotherston’s performances in this promotion campaign that brought him to the attention of new Northern Ireland manager, Billy Bingham. 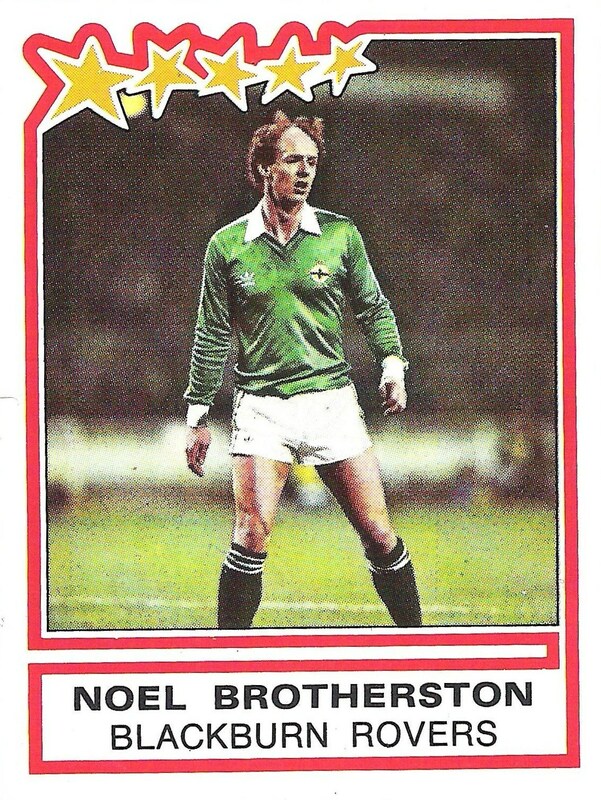 Brotherston played in all three games as Northern Ireland won the 1980 British Championship, setting up the winner for Billy Hamilton against Scotland and scoring in the decisive 1-0 win over Wales, making amends for the own goal he had scored in the 1-1 draw with England. Usually starring on the right wing for Northern Ireland, it was around this time that Howard Kendall started to play him on the left for his club side. After his performances in the 1980 British Championships, Brotherston was linked with many First Division sides, but a move never materialised, he also had to overcome a knee injury which kept him out for much of the 1980/81 season. Consolation came by way of his performances in the 1982 World Cup qualifiers, indeed he scored Northern Ireland’s first goal of the campaign in a 3-0 win over Sweden. Surprisingly the young Norman Whiteside took his place in the Northern Ireland side, and at the Finals in Spain he made just two appearances, both as substitute. 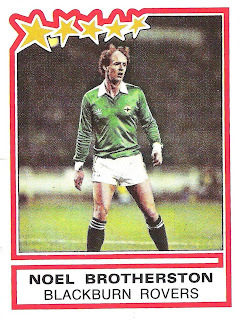 After the 1982 World Cup Brotherston failed to make a prolonged impact on the Northern Ireland side, struggling with injuries and form. He won the last of his 27 caps in the 2-0 World Cup qualifier win over Turkey in May 1985 and he failed to make the squad for the 1986 Finals in Mexico. At club level the disappointments continued as Blackburn Rovers regularly finished in the top half of Division Two, but just couldn’t make that final leap to the top-flight. Brotherston was released by Blackburn in the summer of 1987 having delighted the Ewood Park regulars for a decade, playing 375 competitive games and scoring 47 goals. He finished his League career with Bury in 1989. On leaving the game Brotherston became a painter and decorator in the Blackburn area, but died suddenly of a heart attack in May 1995, aged just 38. Eight days later his much-loved Blackburn Rovers clinched the Premier League title. Perhaps the finest tribute to Brotherston's career came when named "trickiest opponent" by 86-time capped England full-back, Kenny Samson. Summary: 21(6)/3. Won 11, Drew 9, Lost 7. 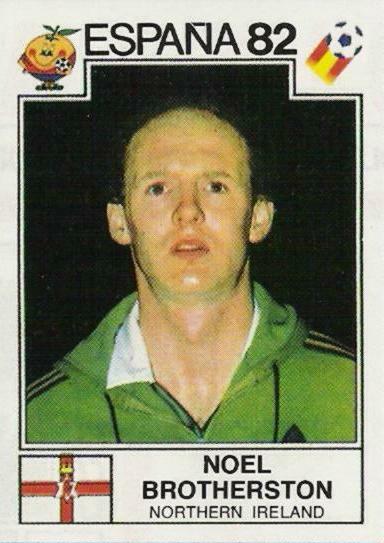 Noel was a very genial, easy going character. When finally retired he set up a small decorating business. He so hated having to be the 'boss' and giving orders that he soon went solo. Sadly missed! I played fiveaside with and against him in a a Youth Football club called Torrin Boys in Dundonald . 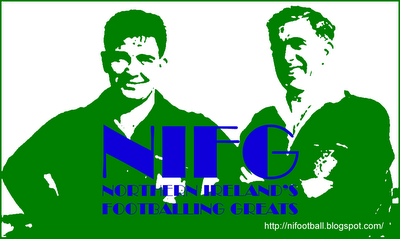 He was a special player and helped Norn Iron win the Home international trophy back in the 1980's.